CARLSBAD, Ca. (June 24, 2016) – Upper Deck, the leader in authentic memorabilia and premium collectibles, announced today that the company has signed #1 NBA Draft pick Ben Simmons to a multi-year deal for autographed memorabilia and trading cards. Simmons is an Australian native who led his high school team to three national championships before making his college basketball debut with Louisiana State University (LSU). Simmons joined LSU after a noteworthy high school career at Monteverde Academy in Florida where he was named Naismith National Boys Player of the Year as well as the Gatorade National Boys Basketball Player of the Year. In college, Simmons was recognized as SEC's Preseason Player of the Year, making him the second freshman in history to earn the award. Last night, Ben Simmons made history once again as the first overall pick in the 2016 NBA Draft. Simmons will now be donning red, white and blue as the newest member of the Philadelphia 76ers. “We are pleased to welcome Ben Simmons to Upper Deck’s world-renowned roster of NBA greats and look forward to providing his fans around the world with the most innovative and authentic collectibles available on the market” ” said Jason Masherah, President of Upper Deck. One of the first items to debut is a limited edition autographed draft day photo that commemorates last night’s historic event. 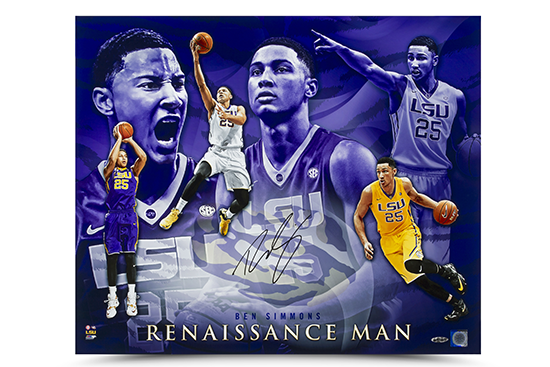 The new Ben Simmons authentic memorabilia collection will also include signed jerseys, basketballs and a signed “Renaissance Man” print that captures his momentous career at LSU. These items and more are now available exclusively at UpperDeckStore.com/Ben-Simmons.